The New Dutch Waterline is a defence line that spans 53 miles. The line starts at Muiden and ends at the Biesbosch and is 2 to 3 miles wide. It consists of 45 forts, 6 fortified towns, 2 castles, 85 machine gun casemates, over 700 concrete troop shelters and casemates as well as more than 100 military sluices and water engineering works. 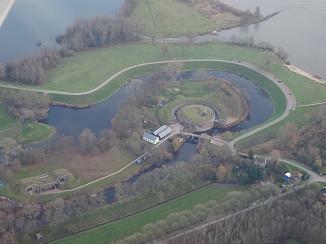 The New Dutch Waterline is the largest National Monument in the Netherlands. On Thursday we made a sight-seeing trip along the Waterline. But shouldnt this be in "Trip Reports"